Whenever I need a dinner recipe that I know will be delicious and enough to feed everyone, I always make one of my family favorites, lasagna. I like lasagna because you can vary the taste so much by just using different ingredients. The other night I made one of my favorite versions, lasagna made with Italian sausage and spinach. This time I used Heinz's Classico Family Favorites pasta sauce. This sauce was so good that it reminded me of the homemade sauce my mom had always made. The perfect blend of spices and seasonings, with just a tiny hint of sweetness. My seven year old grandson, Jayden, has really started to show an interest in cooking. We are all encouraging this because who knows, he could be the next reality show star chef, right? Jayden helped me cook this dinner. We are practicing with this recipe because he and I are making a birthday dinner for his Mom (my daughter) next week. He's super excited about it, and so am I.
I picked up some jars of Traditional Classico pasta sauce when I was doing my grocery shopping at Walmart. Unlike some really great tasting sauces, Classico is so reasonably priced that it helps me save money while I make healthy meals for my family. 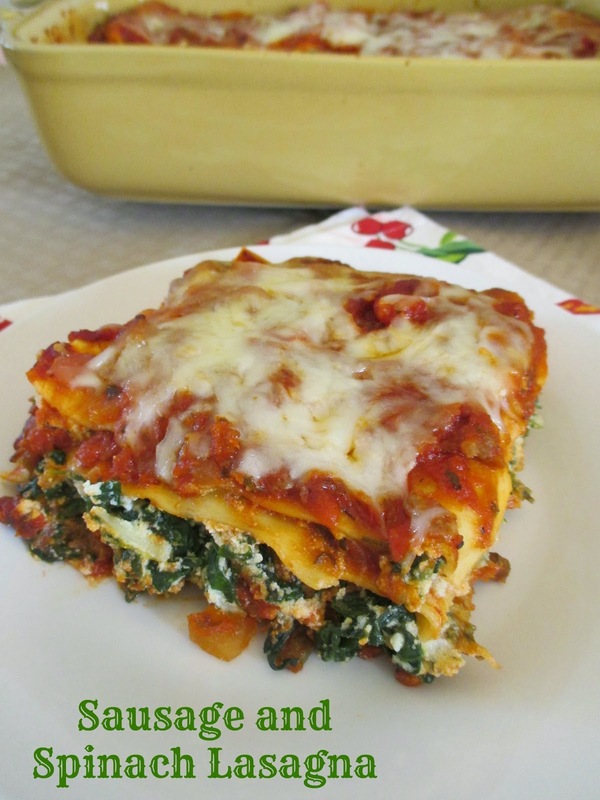 When I make my Italian sausage and spinach lasagna, the kids actually eat it without saying a word about the spinach. Usually they don't like spinach, so I'm really glad they will eat it in this dish. The first thing you do is brown a pound of Italian sausage and chopped onion. I love Italian sausage and stock up on it when it's on sale. I find I use it in so many recipes, and lots of times I will use it instead of ground beef. Then you add two bottles of the Classico sauce, bring it to a boil, and then let it simmer for ten minutes. This will really let the flavors of the sauce come out beautifully. While we were cooking, I was already getting hungry for some of this lasagna, yum!! Jayden was in charge of helping me make the ricotta cheese and spinach filling. He's getting good at measuring ingredients, and excellent at stirring things. I wish I had encouraged my five kids more in the kitchen. Somehow they all miraculously became good cooks all by themselves. There's nothing I love more than a dinner invitation to one of their houses. I love seeing them being creative in the kitchen, and then sitting down to eat what they cooked, with them. So after we made the sauce and the ricotta cheese and spinach filling, it was time to put together the lasagna. I had never used the no-cook lasagna noodles before, but a friend of mine told me they were great, so I used them here. I was a little skeptical but she's a fabulous cook, so I tried them in this recipe. They turned out to be delicious, and really won me over. And it eliminates the big step of cooking the noodles when you make lasagna. 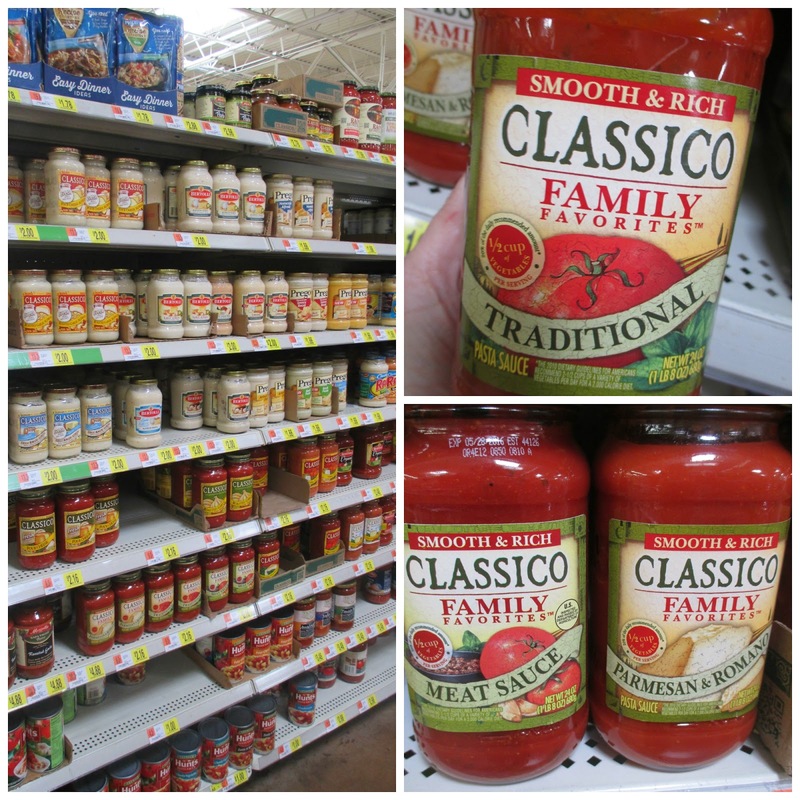 You can find Heinz Classico Family Favorites pasta sauce in the spaghetti sauce section at Walmart. It also comes in Parmesan & Romano flavor, and with the Meat Sauce variety. You can use these sauces with so many recipes, and I see some great dishes coming out of my kitchen soon using all of these varieties. I really love cooking with my grandchildren, and Jayden and I were very happy with the way our dinner turned out. Cooking with these delicious Classico sauces lets me make our #FamilyFavorites even easier to make. Save money with this Heinz Classico coupon when you buy two jars of Classico Family Favorites! Here is my recipe for my lasagna. It feeds 6-8 depending on how you slice it. And I always find it stretches further if you serve it with a green salad and warm garlic bread. In a large skillet, cook sausage and onions over medium heat until meat is no longer pink, drain. Stir in the sauce, garlic, basil and oregano. Bring to a boil. Reduce heat, cover, and simmer for 10 minutes. In a large bowl, combine the spinach, ricotta, and 1 cup of the mozzarella cheese. 1 1/2 cups sauce to edges of noodles. Top with half of the ricotta mixture. Repeat layers. Top with remaining noodles, sauce, and mozzarella cheese. Cover and bake at 375 degrees for 30 minutes. Uncover, bake 10-15 minutes longer, or until bubbly. Looks so good. 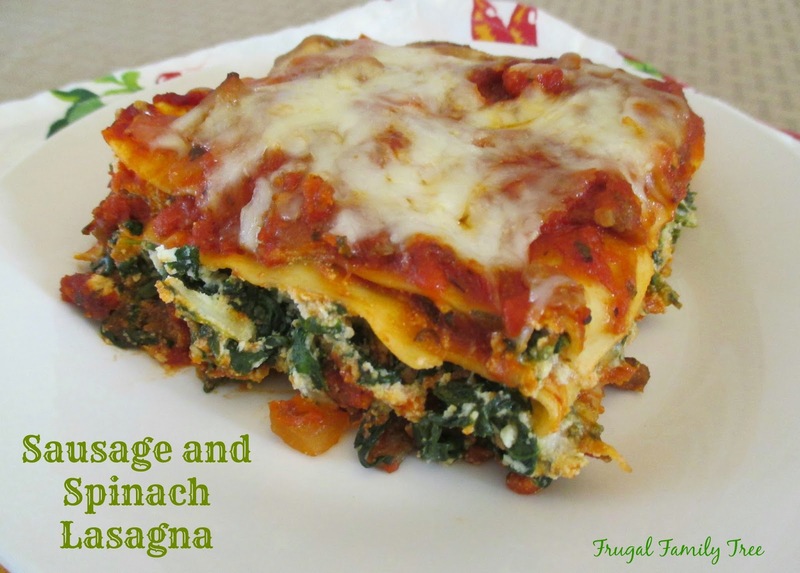 I love spinach in my lasagna! !